BOKONDO, DEMOCRATIC REPUBLIC OF CONGO APRIL 6: Unidentified people on a boat with destination Kinshasa on April 6, 2006 in Bokondo, Congo, DRC. Passengers sleep in the open, often on top of maize bags or other cargo. 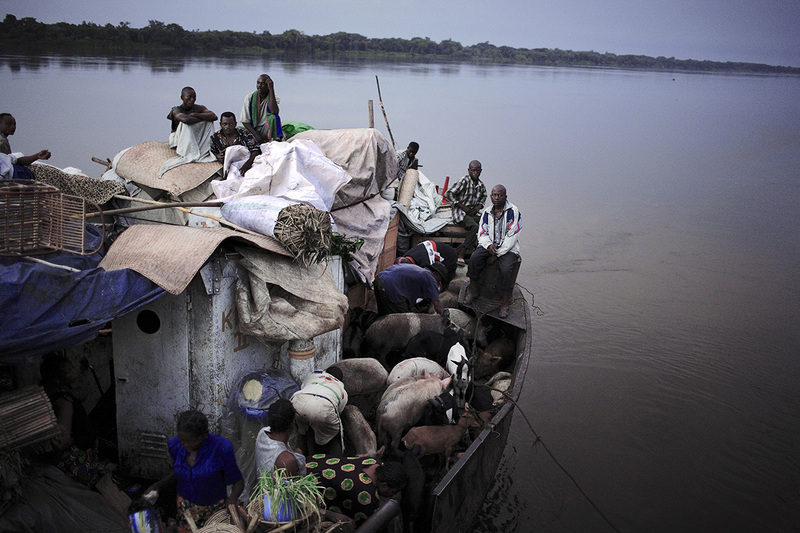 The boat carries many animals such as pigs, goats, crocodiles, monkeys, lizards, etc. The Congo River is a lifeline for millions of people, who depend on it for transport and trade. The journey from Kisangani to Kinshasa is about 1750 kilometers, and it takes from 3-7 weeks on the river, depending on the boat. During the Mobuto era, big boats run by the state company ONATRA dominated the traffic on the river. These boats had cabins and restaurants etc. All the boats are now private and are mainly barges that transport goods. The crews sell tickets to passengers who travel in very bad conditions, mixing passengers with animals, goods and only about two toilets for five hundred passengers. The conditions on the boats often resemble conditions in a refugee camp. Congo is planning to hold general elections by July 2006, the first democratic elections in forty years.